I have recently written a series on Phytodepuration and my Vetiver Grass plants, at that time I couldn’t figure out why my vetiver plants were not thriving. Being successful in Permaculture is about observation and finding the solution within the problem. Today I am here to share my observations on what I was doing wrong, and what changes I made to have a thriving vetiver grass yield. If you’re getting the same results as I did, you can make the same changes and have vetiver succeed. 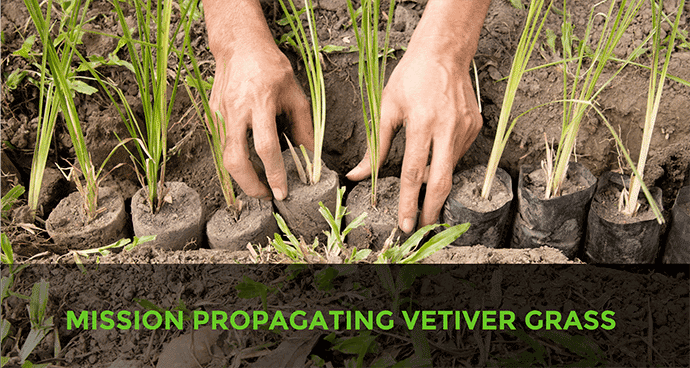 Additionally, I would like to share how to propagate vetiver grass successfully. I hope you enjoy Mission Propagating Vetiver Grass. Vetiver grass is very tolerant of the soil, salinity and, extreme weather conditions. However, the shade is enemy number one to vetiver grass. Shade can cause reduction of growth and potentially cause the plant to die. I now have my vetiver plants in a place where they can get direct sunlight most of the day and, they are thriving! Additionally, The plantlets or slips must develop new roots and, have an extensive amount of water to have grown a well-formed root system. At the beginning of the initial planting, you want to make sure you are irrigating or that you’re in the rain season. I made these two small changes to the vetiver grass, and now I can propagate on a large scale. Vetiver grass must be propagated asexually because it is non-fertile to multiply. I am going to take you, step by step along with the video as I am propagating the vetiver grass plants. When you’re done, fill the channel with water. This last step is very important because you have to remove all of the air. Once you have propagated and successfully multiplied the number of vetiver plants, you have. You are on your way to having a vegetative barrier to help reduce erosion. Or having a plant system that is cleaning your soil or your greywater.